Le Jour Se Lève was a great French classic of 1939 and starred Jean Gabin as a killer who barricades himself in his attic flat. 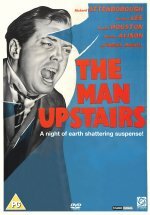 It was remade in 1947 as The Long Night with Henry Fonda, and this too is a remake, with Richard Attenborough going bonkers upstairs while the police downstairs try to calm him down. The motivation has changed (he blames himself for his fiancée's brother's death), but the dramatic set-up is identical and makes for some agreeable tension. Attenborough's ability and eagerness to play pathetic, psychological wrecks is unmatched and flies in the face of his cuddly public persona.